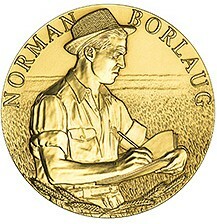 While doing his Nobel-Peace-Prize-winning agricultural research to increase crop yields, Dr. Norman Borlaug had no knowledge of the future development of genetic modification. When this groundbreaking technology was developed, he was a full-throttle believer in and endorser of its potential benefits. At a Capitol Hill ceremony last month, lawmakers unveiled a statue of him along with numerous laudatory speeches. It has not been quite as well publicized, but the President wrote a letter of praise for her grandfather to Julie Borlaug, an old friend of ACSH no surprise, given that Norman was a proud founding trustee of ACSH and would often call us to thank us for the great job we were doing. Obama said in the letter dated April 11, Borlaug s support of investing in education and continuing research in biotechnology are inspirational as we pursue developing new products that can nourish the world s vast population. I share his belief that investment in enhanced biotechnology is an essential component of the solution to some of our planet s most pressing agricultural problems. But this year, they and hundreds of others will get no water from the reservoirs that sustain farming in the Central Valley, where much of the nation s fresh fruits, nuts and vegetables are grown ¦.Heading into the third year of a prolonged drought, the Allens are among the many California farmers forced to make dire choices that could leave as much as 800,000 acres, or about 7 percent of the state s cropland, fallow. ACSH s Dr. Elizabeth Whelan had this to say: I attended the last public appearance by Norman Borlaug, at his 95th birthday celebration in Dallas. He gave a typically-forceful speech calling for an aggressive approach towards implementing genetic-modification technologies into improving food supplies for the malnourished, but also realized that these same techniques could be applied in situations such as that which we face today in California. He urged his colleagues and listeners to stand firm against the nay-sayers and fear-mongers, whose agenda was based on self-interest rather than public health. We are proud to echo his sentiments today and for as long as ACSH is around to do so.